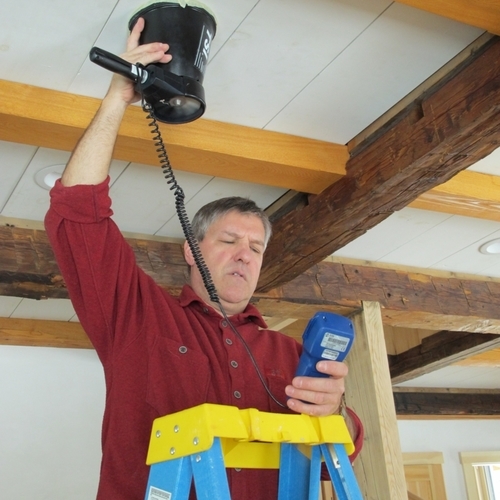 The installation of a heat recovery ventilator is complicated. With so many individual vent lines to manage, careful labeling was essential. Image Credit: David Wood There was room for the heat recovery ventilator on the ceiling of the machine room. The unit is fairly sizable — planning in advance where it will go is a good idea. Editor’s note: David and Kayo Murakami Wood are building what they hope will be Ontario’s first certified Passive House on Wolfe Island, the largest of the Thousand Islands on the St. Lawrence River. 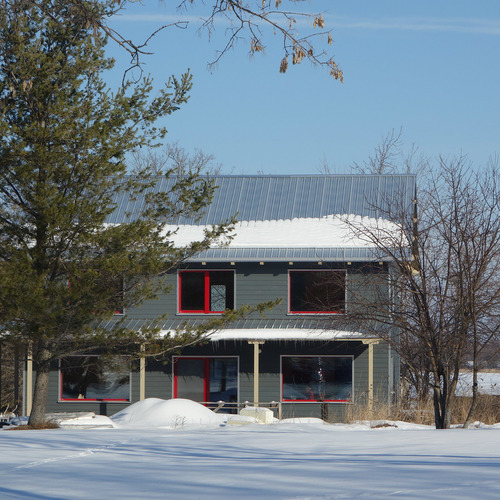 They are documenting their work at their blog, Wolfe Island Passive House. For a list of earlier posts in this series, see the sidebar below. 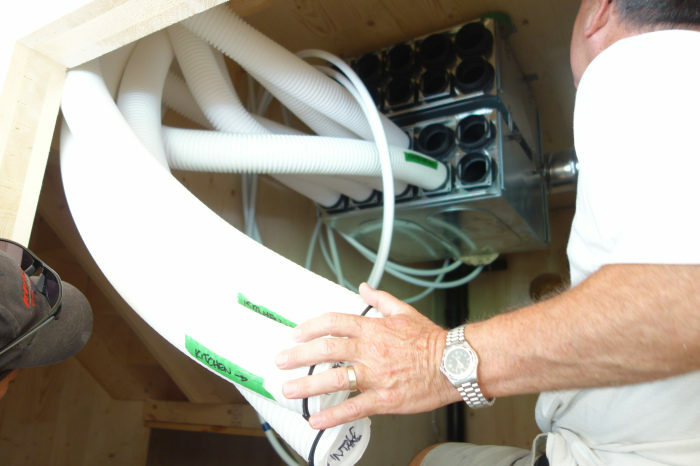 Along with the thick insulation and sealed building shell, the heat-recovery ventilation (HRV) system is one of the most important features of any Passive House. An HRV system is really very simple. In essence, it is a ventilation system with a heat exchanger, so that in winter, when cold air is drawn into the house, it is warmed with the heat from the stale, outgoing air (and vice-versa in summer). However, it is also more than this. The HRV ensures a uniform temperature throughout the house, taking the air heated by the sun through the large south-facing windows and distributing it to other rooms. Our system is also a little bit more than this. With the addition of a very small thermostat-controlled heating element (drawing about the same amount of power as a toaster), it also becomes a low-pressure forced-air heating system. This will be the only artificial heat in the house, and we don’t think we’ll need it that much even in Ontario winters. It’s worth noting that not all HRVs are created equal. Most manufacturers make claims about the efficiency of the systems they make, but few are actually independently tested and verified, and this includes the leading companies in North America. This doesn’t mean they are bad, but you can do so much better. Our HRV (actually, an ERV, but more on that later) is the ComfoAir 200 from Swiss company Zehnder, pretty much the best manufacturer of HRVs in the world. Their tested efficiency is the highest; their systems are the quietest; and their ribbed plastic Comfo-Tube ducting is much better than the old square section metal ducting you might be used to. Our system was supplied, with minimal fuss, by the excellent Hans, from Zehnder’s Ontario dealer, Pinwheel Building Supplies. 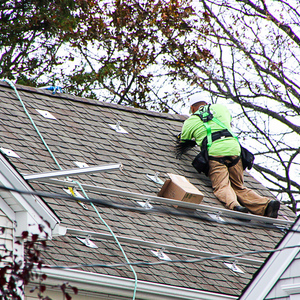 You need to plan for the installation properly from the beginning, though. We didn’t, but we got lucky. The unit itself takes up a fair bit of room. However, they can be mounted on walls or ceilings. Since we have massively over-engineered cross-laminated timber (CLT) ceilings, we did the latter, mounting them up and out of the way in our machine room. There just happened to be enough room. There are a lot of ducts, too — serving fresh air registers and exhaust grilles in different parts of the house — and the ducting goes up through what would have been our chimney openings. Again, this was luck rather than judgment. We also didn’t get the design for the HRV system ducting done before we ordered the timber components, so rather than having pre-drilled fittings, the builders are having to drill through the thick ceilings to make the vent holes. We finally had the little Thermolec 2-kilowatt heating element installed in the HRV intake in December, months after the system was installed, but just in time for a cold snap. 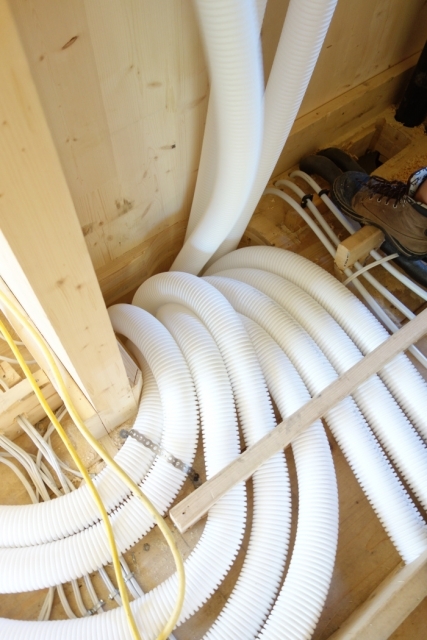 Finding a path for the many ventilation tubes that go along with an HRV isn’t always easy. This element is a bit like a toaster and heats the air coming into the HRV manifold that distributes heat around the house. It is controlled via a thermostat, which is downstairs and not too far away from the kitchen. We are aware that it’s likely to be a bit warmer there than elsewhere, so we keep it at 20ºC (68ºF) knowing this is likely to mean 18ºC (64.4ºF) on average around the rest of the house. All the other heat comes from passive solar, i.e. the south-side windows, but it’s been quite dull recently, so that has not been such a big factor. In addition, we’ve been having further problems with the Motura sliding door. We already had to have it taken off and some new sealing rubber put on, but it’s still not tight. This was not apparent in the recent blower-door tests, we think, because when you pressurize the air inside the house, the sliding door would have been pushed outwards, against the seals. However, at other times, this is not the case, and the higher we have the HRV settings the looser it gets. Compared to most houses, it’s not at all bad, but there is still an appreciable draft around the edges of the sliding door. We have contacted the supplier and await some advice. We might just push some of the left-over rubber gasket from the CLT construction into the edges and tape them up, just for the winter. There was an unexpected development with what we had thought was our HRV. 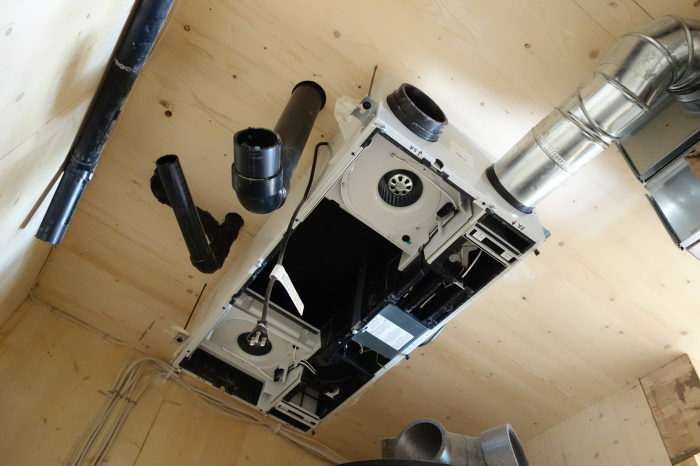 Malcolm Isaacs of the Canadian Passive House Institute had stopped by to carry out the second, and we hoped final, blower-door test and make some final tweaks to the ventilation system to make sure it was correctly balanced. While he was there, we discovered one curious thing: our “HRV” actually appears to have an energy recovery ventilation (ERV) core. This means that actually, it not only uses a heat exchanger to transfer heat from the outgoing exhaust air to the incoming fresh air, thereby keeping the air in the house both warm, but also balances the humidity. This is interesting, not least because we only paid for an HRV, so far as we know. What we now think is that Pinwheel, the retailer from whom we bought the HRV, already knew when we bought it that they were going to stop being the Ontario dealer for Zehnder (they officially stopped at the end of 2016), and therefore were selling off whatever units they had in stock. They probably didn’t have any ComfoAir 200 units with an HRV core left, so they just gave us one with an ERV core instead. That’s just fine by us! The only potential issue is that it probably isn’t the latest model — all the latest Zehnder units apparently now come with a pre-heater for low temperature operation. Without this, ERVs are not, I don’t think, guaranteed to run below about -10ºC (14ºF). But that’s quite common here in winter, indeed it has been -14ºC (6.8ºF) for the last few nights and much lower at times. But we’ve not had any problem with the unit at all. We are recording temperature levels for a project at Algonquin College, but that data won’t be available until it’s downloaded from the recorders. In the meantime, we are just keeping an eye on performance using simple thermometers, particularly when it’s cold outside. And last night, it was very cold outside. When we got up, the external thermometer was reading -15ºC (5ºF), so it could have been even colder during the night, and the winds have been fierce here, so the effective temperature would have been around -25ºC (-13ºF). When we woke up, the temperature inside was 14ºC (57.2ºF) upstairs and 16ºC (60.8ºF) downstairs. With some sunlight in the morning and a few hours of an additional 1-kW heater, this was soon up to 19ºC (66.2ºF) downstairs and 18ºC (64.4ºF) upstairs, and it has pretty much stayed that way since, as the winds blow around the house. This is pretty good. But we shouldn’t need the additional heater, and until we resolve the problem with the Motura door, one way or another, we will not be able to get the more consistently warm temperature levels we would like. It’s certainly not cold — it’s very comfortable — but the house is not yet operating at its optimum. "Most manufacturers make claims about the efficiency of the systems they make, but few are actually independently tested and verified, and this includes the leading companies in North America." This is incorrect. The vast majority of ERVs and HRVs sold in North America are listed in the HVI directory (http://www.hvi.org/proddirectory/CPD_Reports/section_3/index.cfm). All HVI-listed units are tested by 3rd party labs and are subject to random additional testing of "off the shelf" units to verify performance. So you forgot to plan for your mechanical equipment and ended up with the wrong unit? We install HRV's and ERV's regularly and use both Broan (formerly Venmar) and Lifebreath and some Fantech's. We had a huge complex remodel recently and I was psyched to get a quote from Zehnder. Service was excellent but the price for the unit and specialized ducting was a show stopper. And to further point out- regarding testing. 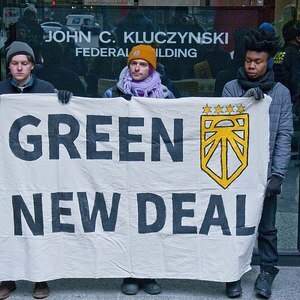 The North American 'test' is protocol CSA439, Done by a certified third party test facility, which manufacturers pay for to have their product first tested. Not HVI. HVI only 'lists' products with published data supplied by the CSA439 test. 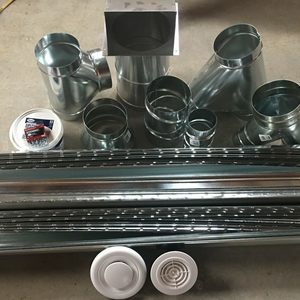 to jespersen- UltimateAir.com now offers a duct kit with their residential ERV's. Thanks for the information on the HVI testing. As far as I remember, this information was not so easily available when we were doing our research 2 years ago. Has the website been changed or did we somehow miss all this? The HVI listing of ERVs ad HRVs is easier to sort through now (it used be a simple PDF list)...but it's been readily available since before I started in this line of work in 2007. I should also say that I don't edit these entries, they are done by GBA staff. Normally I get asked questions beforehand but this time I didn't so I've had no involvement with this entry. It's simply edited together entries from the original blog. GBA likes keep the 'live' feel of that, even though this entry consists of several entries from different times written with different knowledge. If I was writing an entirely new blog entry 'looking back' on this story, I wouldn't write it this way. That's just a note to help anyone who is reading these. I will probably, at some point, do such a write-up on our actual blog, when I get the time. 1. No, we did not forget to plan for mechanical equipment. 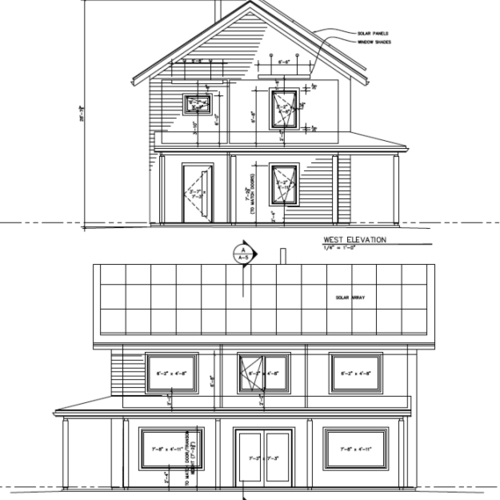 In fact we had two versions of a mechanical plan done, one in the previous iteration of our house plan when we were not planning on using CLT, which was then adapted for the version done after we had decided to go with CLT. The original version was done by a professional heating engineer, the adaptation was done by the architect, and both versions were approved (they have to be as part of the building process here). However, the specific HRV make and model were were going to use was not in the original plans - which is why we didn't have any holes for vents etc. So we did make changes in practice, based on the machinery we actually bought and examining how it would work in place. That's what normally happens with plans. 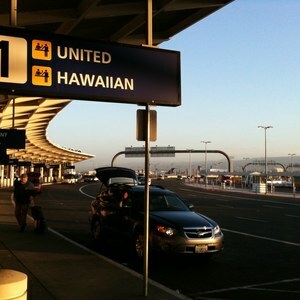 You can be as precise as you like, but they've also got to be flexible enough to accomodate changes. In this case, we did three things differently: 1. (not in this blog entry), we moved the location of the 'core' where the ventlation ducts would go because we decided not to go with a stove and therefore had extra room to use the space where the chimney might have gone; 2. as the blog describes, we mounted the HRV unit on the ceiling rather than the wall - because the Zehnder unit we ended up buying can be mounted either way. Luckily our ceilings were high enough to do so, and this gave us extra room on the walls of the utlity space, which in turn will allow us to more flexible in future with things like home battery system installation; 3. as the Zehnder system uses very particular types of ducting, we had to adapt the plan again, but we had room to do so. Describing it as 'luck' is self-deprecating, it was actually being flexible about our plans that allowed us to do this. 2. We got the unit we ordered - the Comforair 200 - and with the correct orientation. However each Zehnder unit can contain different 'extras'. We ordered one with the basic HRV. What we ended up with has the extra ERV element too. That's fine by us - it's actually a more expensive extra which we got for nothing. We are happy, we don't plan to make any fuss about it and as Pinwheel are no longer official Zehnder dealers for this area, if we did want to return it and get the original basic unit, it would probably all get complicated - and for no reason at all. I'm sorry if my questions have irked you. I probably wouldn't have persisted if you had provided answers that dealt with their substance, rather than dismissing or sidestepping them. What helps others reading a description of a build, especially one using innovative techniques, is a clear-eyed examination of the consequences of the decisions that were made. Making assertions as to the superiority of the methods you employed without going back and reexamining them, and treating all mistakes or changes as serendipitous, doesn't leave us with any way of evaluating the usefulness of following your advice, beyond your conclusion that you are happy with everything, even if it wasn't what you planned. I'm sorry. In retrospect I probably should have just bitten my tongue. I am glad you are happy with the way things worked out and wish you all the best. I had a similar experience with ordering a Zehnder HRV and getting an ERV. I requested a quote on an HRV, and they listed an ERV on the quote without noting that they were recommending that substitution. I reviewed lots of details on the quote, but didn't notice that one until the unit arrived. To Zehnder USA's credit, they were willing to swap it out at no charge, but I ended up deciding to keep both so that I can indulge my energy nerd tendencies and swap cores as conditions merit one or the other. I also planned for the installation, but not quite as well as I should have, and found fitting all the equipment in the utility room more of a challenge than expected. David: What made you choose the Thermolec heater, as opposed to any other option, such as a variety of individual room resistance heaters or a minisplit? I'd think running a 2kw heater might use up a good deal of power. David, can you clarify where the Thermolec heater is located? This sentence makes me believe it's on the outside air input to your HRV and is (in part) being used for defrost: "We finally had the little Thermolec 2-kilowatt heating element installed in the HRV intake in December, months after the system was installed, but just in time for a cold snap." However this sentence caused to me to think it might be after the HRV but before where the ductwork splits to feed various areas in your home: "This element is a bit like a toaster and heats the air coming into the HRV manifold that distributes heat around the house." I have an HRV question for you. Please pm me @ [email protected]. Sorry, everyone, we've been away and offline. Stephen - simply put: advice from those we've been working with. We have a relatively small house and the numbers of vents is not large anyway. I had initially thought the way you are thinking, looking at models like the G.O. Logic Passive House, but because the air is being distributed around the place at a pretty constant rate, the whole volume gets to an even temperature pretty quickly and stays that way. It's also just simple. And one of the things we've really tried to do with the place (and this is nothing to do with being a 'passive house') is make sure that the technology involved is as simple as possible and easy and inexpensive to access, fix and replace, whether it's water or heating. What this means is that if we do decide to change things based on a few years' experience of living here, it won't he hard to do so. We could even still install a stove or similar of we felt like it. The only relative inflexibility we have is the solid wood walls! Andrew - your second supposition is correct. If you go to the blog and take a look, you'll see it's installed between the HRV unit and the manifold. I'd also like to apologise to anyone who has found this particular blog post unclear. 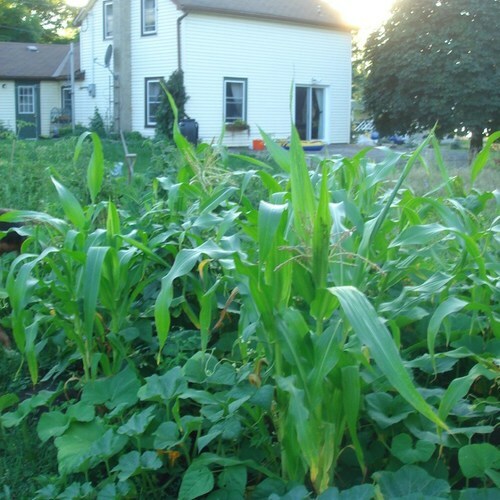 It's entirely my fault for writing the way I do in the original blog which doesn't seem to fit the needs of people here. I'll ask to review future entries (if there are any) for clarity in future.